On December 2, East Shore hosted 44 northwest anti-racist activists! 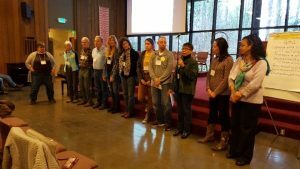 They gathered from UU congregations around the area – Cedars, East Shore, Edmonds, Westside, Woodinville, Northlake, University and Kitsap, as well as two United Church of Christ congregations – North Shore and Alki, and even a member of a Christian Science Church. Most important, they all brought their knowledge and their passion, and they shared their resources, activities, successes – and their challenges. Reverend Lois Van Leer of Woodinville provided a provocative and inspirational opening, and Leslie Schmidt and Louise Wilkinson facilitated the event, and Jeanne Lamont and many other East Shore members handled the logistics. Li Lu-Porter centered us in our hearts, and fifteen East Shore members shared our experiences with Beloved Conversations, Flash Stances, book discussions, panels, worship services, and Conversations About Race. 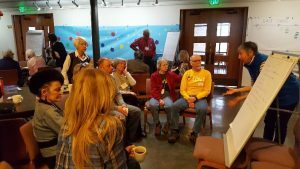 Other congregations shared similar and different activities, and many remembered coming to East Shore to hear Robin DiAngelo – some more than once! Many shared similar challenges – the whiteness of our congregations, the pushback generated by success and by reactions to the term “white supremacy,” the disillusionment people of color feel as they witness this resistance, the wide spectrum of racial awareness in every congregation, the question of how to take effective action. Aisha provided insights into the deep and unconscious ways our congregations center the issues of white people, and participants spent the afternoon sharing ways to address these many challenges. This was the beginning of an effort to forge more cohesive ties between anti-racist activists in the area. We learned so much from each other, and recognize that collaboration with each other and with other organizations in the area can magnify our impact.